A quick method for making accurate, virtual universes to help understand the effects of dark matter and dark energy has been developed by UCL (University College London) and Centro de Estudios de Física del Cosmos de Aragón (CEFCA) scientists. Making up 95% of our universe, these substances have profound effects on the birth and lives of galaxies and stars and yet almost nothing is known about their physical nature. 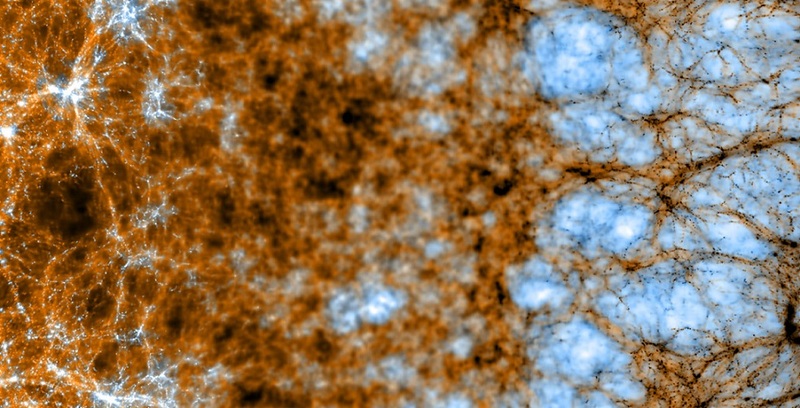 The new approach, published in Monthly Notices of the Royal Astronomical Society and funded by the Royal Society, is twenty-five times faster than current methods but is just as accurate, allowing scientists more computer power to focus on understanding why the universe is accelerating and galaxies are positioned where they are. “To uncover the nature of dark energy and the origin of our 14 billion year old accelerating universe, we have to compare the results from big studies to computational models of the universe,” explained Dr Andrew Pontzen, UCL Physics & Astronomy. “Exciting new ventures, including the Large Synoptic Survey Telescope and the Javalambre Physics of the Accelerating Universe survey, are on the horizon, and we want to be ready to do the best possible job of understanding them”, added joint author Dr Raul Angulo, CEFCA, Spain. The scientists say their method will speed up research into the unseen forces in the universe by allowing many model universes to be rapidly developed to test alternate versions of dark energy and dark matter. “Our method allows cosmologists to run more creative experiments which weren’t feasible before due to the large amount of computer time needed. For example, scientists can now generate lots of different models of dark energy to find the one which best explains real-world survey data. We could also use this approach to see how individual galaxies look and fit inside the overall structure of the universe by spending the freed-up time on computing the virtual universes in much greater detail,” said Dr Pontzen. The new method removes the biggest uncertainties in the model universe by comparing its properties with an ‘inverted’ version. In the inverted model universe, galaxies are replaced by empty voids, and the empty voids of space with galaxies. The scientists tried this approach after noticing a mathematical symmetry linking the two seemingly different pictures. When they compared the output of the paired universes to that of the gold standard method – which averages 300 virtual universes to remove uncertainties – they found the results to be very similar. The new approach showed less than 1% deviation from the gold standard, suggesting the new approach makes predictions that are accurate enough to use in forthcoming experiments. “In addition to the reversal process, we also adjust the ripples of the early universe to carefully-chosen values, to further eliminate inaccuracies” added Dr Angulo. The team now plan on using the new method to investigate how different forms of dark energy affect the distribution of galaxies through the universe. “Because we can get a more accurate prediction in a single shot, we don’t need to spend so much computer time on existing ideas and can instead investigate a much wider range of possibilities for what this weird dark energy might really be made from,” said Dr Pontzen.